So, when Christina shared this on the Epbot FB page, I of course had to drop everything and run over here to post it right away - even though the dropping and running were in a purely virtual sense, since I'm just sitting here clicking and typing. But there is a definite sense of urgency to it, let me tell ya. 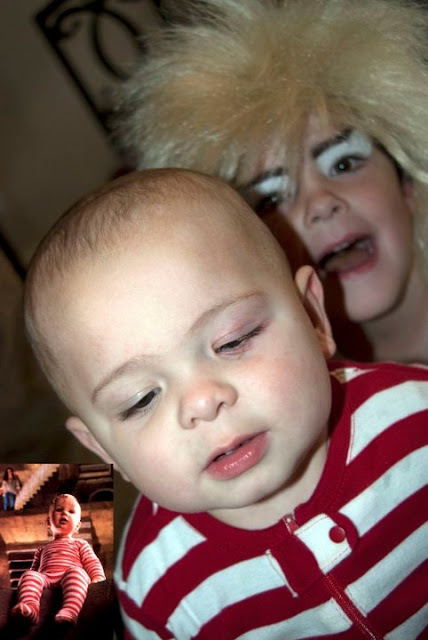 Oooh, and this gives me the perfect excuse to share Heather H.'s family Labyrinth costumes! He reminds me of the babe. And say "'ello" to this little fella! This entire family is made of WIN. Kudos, Heather! Ok, this concludes my Labyrinth Love Fest. 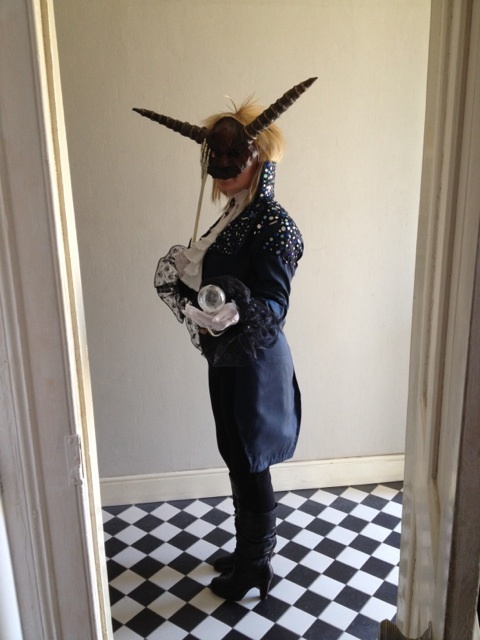 UPDATE: Someone in the comments linked me to the most impressive Goblin King cosplay I've ever seen. I mean, WOW. You'd almost swear that was Bowie himself, wouldn't you? His name is actually Massimiliano Poggi, and you can see a few more pics of him in Sandman-AC's DeviantArt portfolio. I adore Contact Juggling... another great person to watch doing it is Viktor Kee, who is in Cirque du Soleil on DVD. I did, yes! I love contact juggling; there was a time I was sad that my teensy little hands could never manage it. But then I realized I'm too lazy to learn, anyway, and I felt better. I once watched a youtube vid of a performer in Central Park doing the most amazing contact juggling routine - I'll have to go hunt that down again! Um, totally awesome. Love that cover and the costumes are so adorable! Every day I love you more and more, Jen. My absolute ALL TIME favorite movie. I have owned four copies of it since I kept wearing my VHS tapes out! 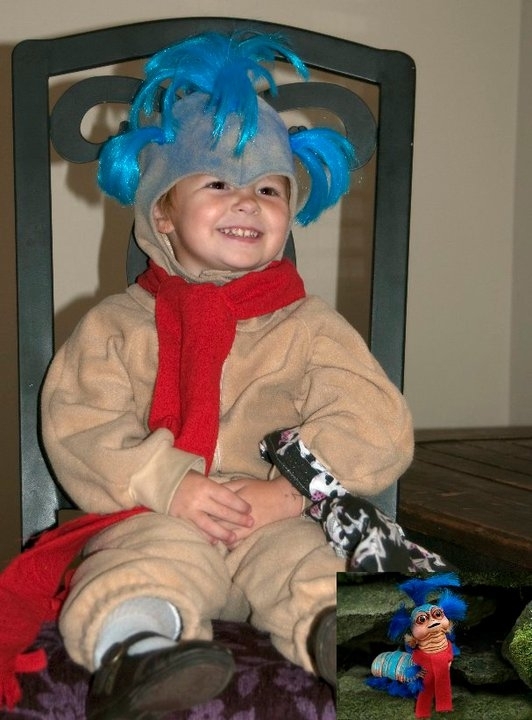 I remember dressing up just like Sarah! I looooove Labyrinth so much. My hubs even got me a Jareth t-shirt for Xmas one year, its my go to t-shirt when I can't decide what to wear. And her song was FANTASTIC!!! 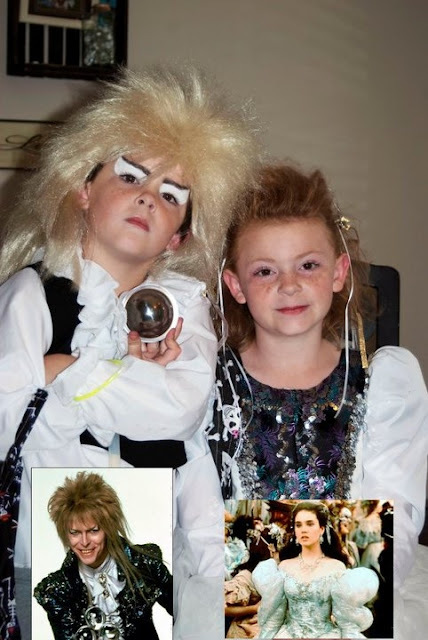 and now I wanna dress up everyone in Labyrinth cosplay. I wore out my Labyrinth soundtrack cassette and had to buy a second one. Oh yeah. I'm a huge Labyrinth nerd... even knew about contact juggling and everything! Labyrinth is one of my fave movies, too! So amazing! I quote it all the time. I watched it in college, but usually after a few bevs. It was one of my favorite drinking movies... that and Rainbow Brite. If she makes that available again, make sure you post it! That was FANTASTIC! Love, love, love the costumes! Aaah. Labyrinth. Love me that movie!! I once had a prospective beau make me a mix tape in high school that included the entire soundtrack of Labyrinth, Mahna Mahna (by The Muppets) that one Bryan Adams song from Robin Hood and the Earthworm Jim theme song. Among other things. Oh, to be young, in love and a band geek once more! menhanI love even harder than I did ten minutes ago before I read this post. I loved that family costume set, those kids have the most RAWKawesome parents in the entire universe. 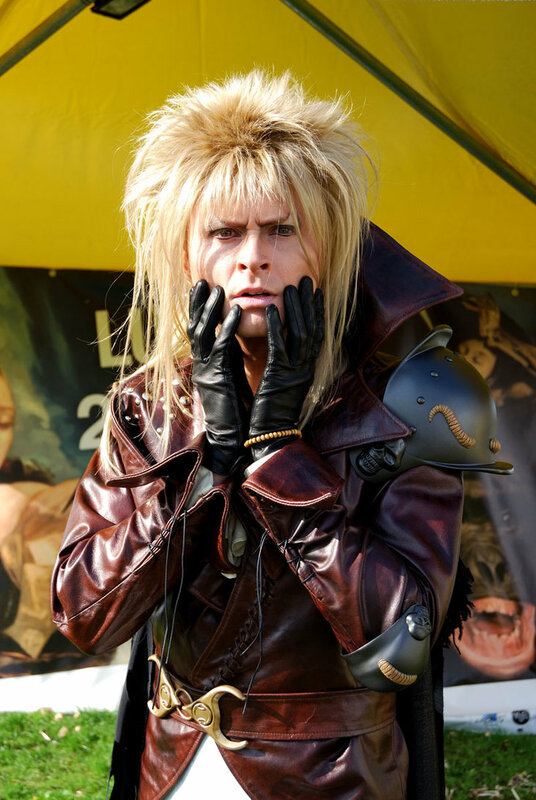 Now that I know that you love Labyrinth and I know how mush you love cosplayers, I think you should see this guy. Holy WHOA. I still double take think that it's David Bowie . . . but it's NOT. And he made the whole costume himself. IMPRESSED. Sarah's ball gown is still on my list of replicas to make, but I'm holding out until I can find the perfect fabric -- I've been very unhappy with all of the replicas I've seen so far. The singer in that video really reminded me of Happy Rhodes (who is also a huge geek girl, of the space and literature variety--a lot of her music reflects it). Here's a link to her performing one of her best songs, "Temporary and Eternal." Jen I have used Zamzar many times to get videos from Youtube and I never have had any problem with them. I even use it for work. One of my all time favs!!! Do what? Remind me of the babe!! lol I love it... gotta go listen to that now! I told my sister two weeks ago if I met a man that got the "Nothing? Nothing? tra la la" reference my sense of morals and decency would go out the window. Also, it makes me happy to know there are others out there who know all the words to the Chilly Down rap. Sorry about the sound on the video. The wife was annoyed that I couldn't hear her asking me to turn around! I've managed to collate all the pics into a blog post about how I created each piece http://cakesandbakesmakes.wordpress.com/2012/02/21/jareth-the-goblin-king/ if you want to share the link. Hopefully it inspires other peeps to try and make it themselves! Be warned, it's a lengthy process. I loved Labyrinth so much that I watched it until my vhs tape literally snapped, right before a family vacation. and I refused to leave on vacation until I knew it was fixed! my mom took it to my aunt who put it back together (I really think with scotch tape)and I had to watch to make sure it worked before I would get in the car! the tape was always wonky at the closing credits. Luckily my hubs brought it for me on DVD very early in our marriage. That. Was a gorgeous cover omg. Geekella has now changed the download link for the mp3. Also, I did not realize that Dr. Beverly Crusher was the choreographer for this movie. The mind it boggles. AWESOME!!! Labyrinth is my favorite movie ever, and I have a certain love of acapella, but always reminisce that not enough women sing it. This is awesome. I love, love, love Labyrinth. Every year that I have been teaching, I've made it a point to watch it in class with my kids so that I can introduce it to a new generation. I've never had a student who didn't love it. When I was little I spent a long car ride from my aunt's house to my house repeating the movie almost verbatim (from beginning to end). I'm surprised she didn't tell me to shut up at some point! Oh, and my friend had a punk band back in high school and they used to do a cover of Chilly Down. I had an old copy of the book, but gave it to one of my students who loves the movie as much as I do. When our kids are bad, my best friend and I will call each other and simply say, "I wish the goblins would come take them away. Right now." It's such a compliment that you liked my cover enough to put it on your blog!!! You seem like a really awesome person and I want to check your blog out now haha. Isn't Labyrinth a magical work of genius? There's just something about Henson's vision combined with the musical expertise of David Bowie and Trevor Jones that creates a feeling you don't want to have go away when you watch the film. I've watched (and still watch) this movie a million times, zoned out to the addictive soundtrack, and am on a never-ending search for a rare copy of the novel adaption. I could go on and on about how much I love this movie!!!!! She has reposted the mp3 and updated the video description. Labyrinth is still my avourite movie. I remember when it came out I was just smitten. In high school I would rent the movie almost every weekend and as a wedding present, my best friend bought me the soundtrack. Which I still listen to (minus track 8 o course). My daughter thought it was called movie the first two years o her life because whenever I asked her if she wanted to watch a movie I would put it on. Now she calls it Sarah, Hoggle and Toby. That family costume is incredible. So jealous! And the Jareth cosplayer? Wow, I was like 'There is nowhere int he movie with that background." P.S. I own the four volume manga series published by Tokyo Pop. They are Meh. They could have been better but someone somewhere got bored. (it would seem) and then pushed out the last book to be done.